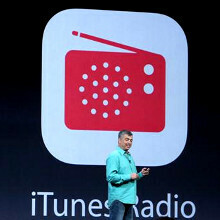 Just as rumored, Apple took to the stage today and announced a streaming music service of its own - iTunes Radio. It lets you create your own stations, mix and match, thumb up a song to buy it, and get the tunes delivered to your iDevice over the ether. The iTunes Radio service is surprisingly free for all iOS 7 users, integrated in the music app as well, and will show ads to recoup some of the streaming costs. It learns what you have liked before and creates similar alternative stations for you, and can also remember your history so you have your preferred music on all devices. That includes iOS 7 devices like iPhone, iPod Touch, iPad, but also with iTunes on Mac and PC, and Apple TV as well - moreover, for iTunes Match peeps it will not only be free, but ad-free too. The new Genius jukebox service can access the entire iTunes catalog, which, at the moment, hosts more than 26 million songs, with Sony, Universal and Warner portfolios at your disposal. 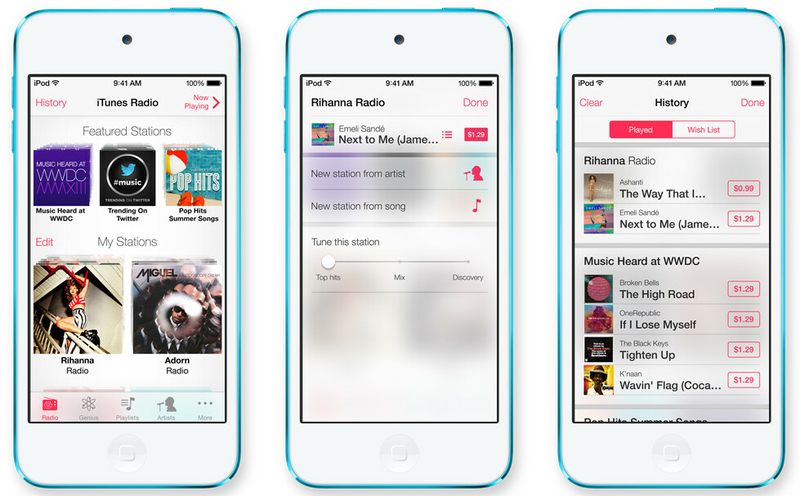 iTunes Radio will be available in the US first around this fall, and gradually rolled out to other regions afterwards. Isn't this identical to Pandora? Yes but with more litigation. I mean innovation. Carriers will LOVE it. Nothing like streaming to blast through your monthly data allocation.... And those with unlimited data plans will be throttled that much quicker. Pandora doesn't have a very complete music library. If the iRadio is based on the full iTunes music store, then this is legit. Looks like Apple is trying to hurt Pandora's business for sure. Good stuff. How it looks like Pandora might take a hit. Or people comfortable with Pandora might just pass and continue to use what they use because we are all lazy creatures of habits. However this is a good move by Apple.